The Crystal of the Day for Wednesday 30 October 2013 is Cavansite. Cavansite is a rare mineral forming small blue sparkling rays of crystals. It is found only in a small area of India. Cavansite is rarely collected due to its scarcity and difficulty of mine access. Cavansite unites the throat and third eye chakras for clear insight, effective communication and greater understanding. Cavansite is a stone of revelation and prophesy, stimulating spiritual breakthroughs. Cavansite is a stone that aids in many psychic areas. It can stimulate intuition greatly, heightens psychic awareness, stimulates the third eye, and enhances channeling abilities. It is especially helpful in psychic healing and protects the healer during psychic healing sessions. Emotionally, cavansite helps get rid of negative thoughts and beliefs, and inspires new ideas. It helps see what part of life need attention. It also helps one relax. Physically cavansite is helpful for sore throats, general healing, and diseases which it helps eliminate and keep from returning. 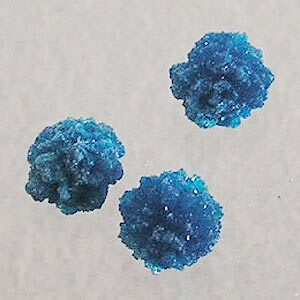 Cavansite is related primarily to the throat and third eye chakras. Used with emerald, rose quartz, pink tourmaline or morganite, cavansite enhances the communion of the heart and mind. Used with stilbite, it opens the heart chakra and used with apophyllite, cavansite increases psychic abilities. The Crystal of the Day for Tuesday 22 October 2013 is Rubellite (or Red/Pink Tourmaline). Pink tourmaline is a gentle stone that directly touches the heart! The colour varies widely from pale pink to deep red. Relaxing and nurturing, pink tourmaline is associated with feminine energies. It vibrates a deep resonance with the heart chakra. It has the potential to heal emotional wounds with its soft, soothinig energy to bring feelings of comfort and safety. 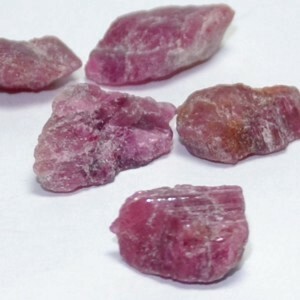 Rubellite stimulates not only the Heart Chakra, but the Root Chakra as well, bringing an increased flow of prana, or life-force energies, to nurture and heal the emotional body. Its grounding influence increases a zest for living and for lively interaction with others. It helps revitalise passion and joy in sexuality, and aids in making dedicated commitments based on love. Rubellite is useful in treating disorders of the digestive system, lungs, pancreas, spleen and liver. It aids in supporting and repairing the reproductive system, as well as stimulating blood circulation and balancing the structure of blood vessels and veins. Rubellite soothes the nervous system and may be useful in treating hysteria, depression and obsession.